I made the eggs using the same metal tape technique I showed you guys last year, applied over paper craft eggs from JoAnn's. They're finished off with a few jewelry charms from my stash, held in place with black-tipped sewing pins. That copper "Easter grass" around the eggs is actually a copper scrubbing sponge, unraveled. It makes a delightfully springy metal tube when you unroll it, so I'm already trying to think up new crafty uses for it. It was a bit tedious cutting and "riveting" all the tiny pieces of metal tape for these, but I love the look. The template is an instant download for $5, and I think well worth the money. It'd have taken me forever to figure out the angles for the side panels, not to mention the brim size! Plus the guy behind LostWax, Chris, has several more great templates and videos, which I guarantee you'll want to watch. He's really inspired me to play with foam more, now that I've witnessed the miracle of contact cement. (Seriously. SO FUN.) I can see myself making lots more of these hats, too, now that I'm home and have access to all my crafting tools! 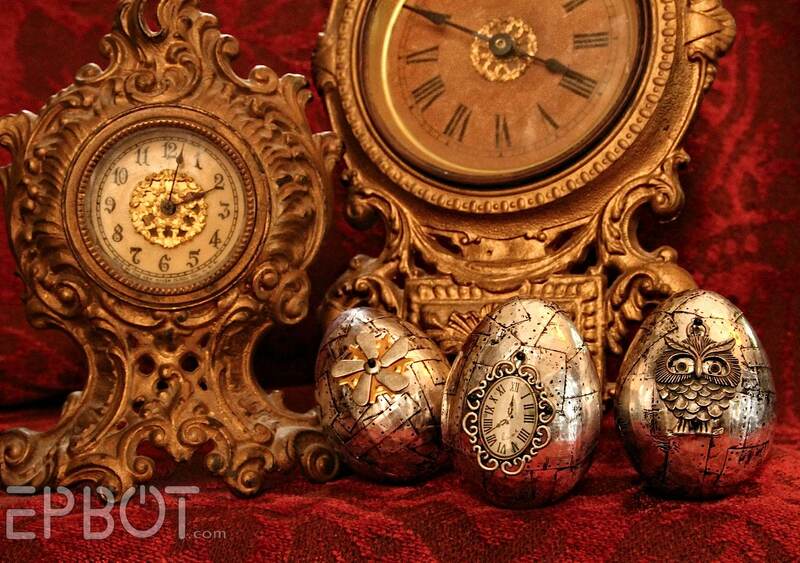 Awesome steampunked eggs! Love the owl; he's so freaking cute. The copper scrubber "Easter grass" was a brilliant idea, too. Are those eggs the size of regular chicken eggs, or are they the larger size...like goose eggs? Would have never guessed that hat was made from craft foam. It looks legitimately like felt in the photos. Thanks for introducing me to LostWax. I'm going to be losing a lot of time watching all Chris's videos now. Will you be showing us photos of the remodel at your parents' house? Hope so! Happy April Fool's Day! Don't let anyone trick/prank you!! Thanks! And yes, they're just regular chicken egg size - pretty small. OMG you MADE those?! When I look at them carefully then of course they have that characteristic Epbot flair, but on first glance at the top photo I was immediately like "yowza, more exquisite objets d'steampunk that some overseas metalwork artist is selling for hundreds or thousands of bux---oh wait, those are CRAFT EGGS that JEN made? whoa!!" 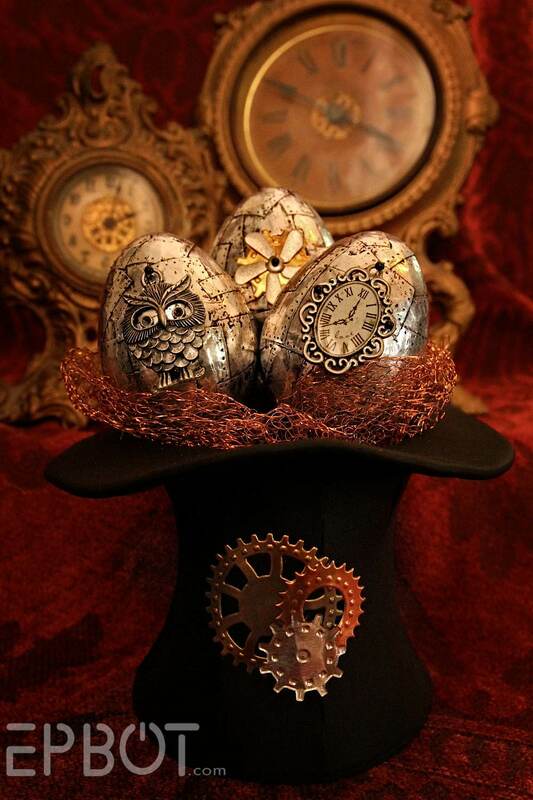 I think I love the top hat display almost more than the eggs, so awesome! And those clocks are amazing! I love those so much! Now I know what I'm doing this weekend. These are so cool! If they make giant paper eggs, I would do this in a giant version (for laziness, and because steampunk baby dinosaurs/ostriches are even cooler than steampunk baby chickens). Sidenote, I thought of you this morning when I saw that American Science and Surplus has a bag o' gears for sale right now: http://www.sciplus.com/p/ASSORTED-SMALL-STEAMPUNK-GEARS_54468. I don't know if that's a good price on decorative gears or not, but there it is! Love love LOVE the whole project! These eggs are my happy thought for the day! Good work Jen and thanks for sharing. These are amazing! You continually impress me on the daily. Glad Williamsburg was fun, and you had time to craft. Happy Easter, Jen & John! Oh, those are delightful! I would not have the patience with the tape and rivets, but I can certainly enjoy seeing the results of your hard work. Thanks for sharing! 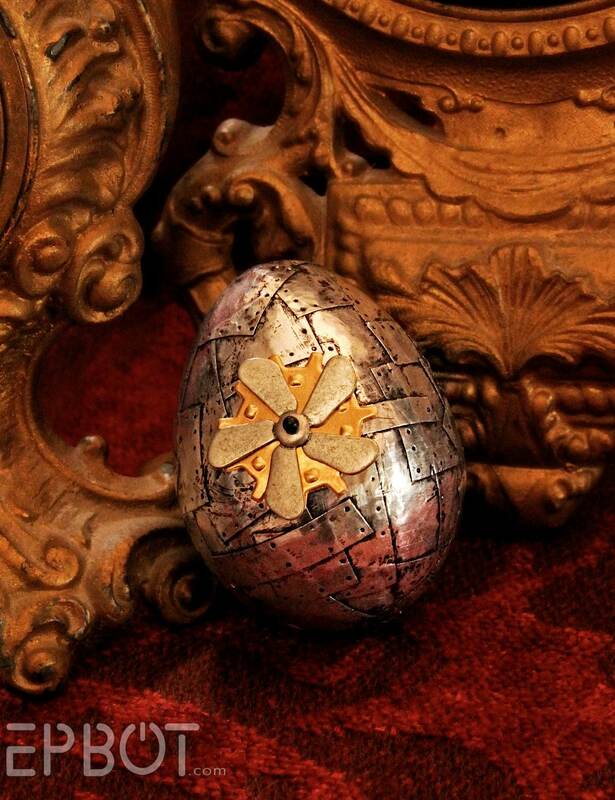 The eggs are so beautiful and detailed. I was wondering, do you think the metal tape would work on plastic eggs? It should stick pretty well, if only because in addition to the adhesive it's very aluminum foil-y, and will mold itself to fit the shape. You'll be able to peel it right off the plastic eggs, though, so just be careful with it. I use that copper mesh in papercrafting all the time for a pop of texture or metallic shimmer. Glue dots hold it in place great. Plus a little goes a long way. I love this! So creative and funky and Eastery! I was inspired to create an autograph book for my brother to take to the Coca-Cola 600. I used the blue color for his book because it's the color of the car of his favorite driver, then stuck the numbers and the logo on the car that his driver chose for this race. I used three coats of sealant on it to give it a really smooth finish. Thanks for the inspiration, Jenn! 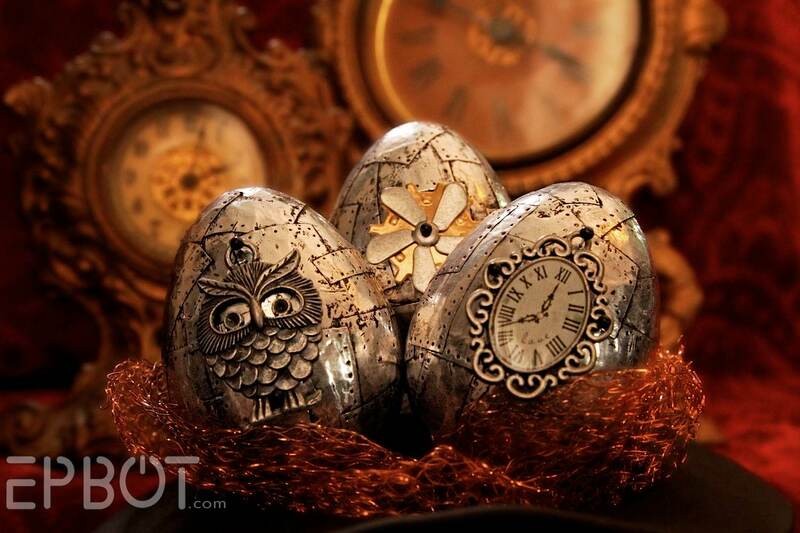 I love your creativity and the eggs are gorgeous. (I've got some waiting in the corner for a chance to be steam-punked).